Multi-/hyper-spectral images are very rich in terms of information which cannot be captured by normal RGB sensors. This load of information is proven to be of paramount importance for several fields, e.g. remote sensing, medicine and digital humanities. Many art historians take advantage of digital image processing in the field of historical paint studies. One of their interests is separating the paint/sketch layers in order to study the evolution of paint and understand the artist during creating the art. Each paint contains different inks produced by different materials. 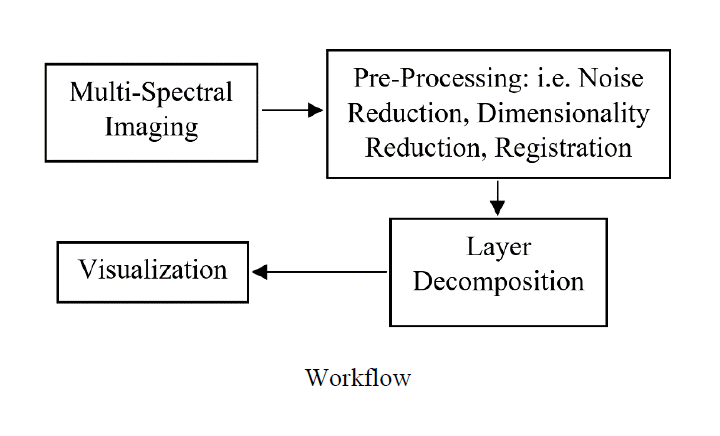 Each material has different reflectance response which can be recorded using a multi-/hyper-spectral camera. The aforementioned facts will motivate our proposal of using multi-/hyper-spectral images to separate the sketch/paint layers of paint. In collaboration with an art historian, we were provided with some phantom data. Each phantom data was produced using papers and inks/chalks similar to the ones used in ancient paints. We used a multi-spectral camera, capable of capturing the spectrum in the range of 400-1000nm wavelength in 1040 channels for imaging. Applying two well-known clustering techniques, K-means and Gaussian Mixture Model, on pre- processed images, their performance on layer decomposition is studied and compared. Lloyd, Stuart. “Least squares quantization in PCM.” IEEE transactions on information theory 28, no. 2 (1982): 129-137. Friedman, N. and Russell, S., 1997, August. Image segmentation in video sequences: A probabilistic approach. In Proceedings of the Thirteenth conference on Uncertainty in artificial intelligence (pp. 175- 181).